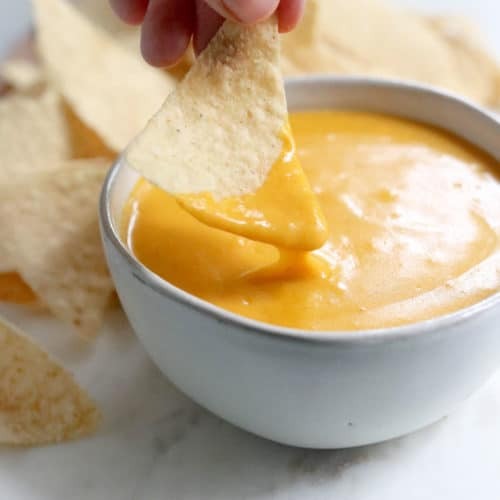 It makes a great appetizer when served with chips, or it can be served over baked sweet potatoes or veggies, and you can serve it over anything else you want to smother in cheese. Most vegan cheese sauces that I’ve made in my life, like the one for my oh-so-popular Vegan Mac n’ Cheese recipe, use a base of blended cashews to create a similar creamy texture to dairy-based cheese sauces. The cashews add creaminess and have a very mild flavor, making them perfect for a creamy vegan sauce, but they’re not ideal for people who need to cut back or avoid eating nuts, in general. That’s why this nut-free vegan cheese sauce is so brilliant. The recipe comes from my friend, Alisa, from GoDairyFree.org. 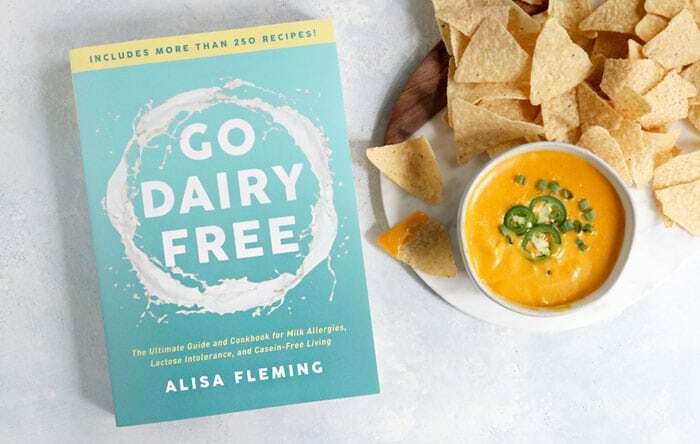 If you’re not familiar with Alisa, she has written what I would consider a dairy free “bible” called Go Dairy Free. It’s a huge book, filled with practical tips for those who need to cut dairy out of their lives, and she recently released an updated version filled with more recipes than ever before! Instead of using nuts, this recipe gets its texture from a blend of softly cooked carrots and gets its authentically “stretchy” texture from the use of arrowroot or tapioca starch. I hope you’ll enjoy this vegan cheese sauce, too! 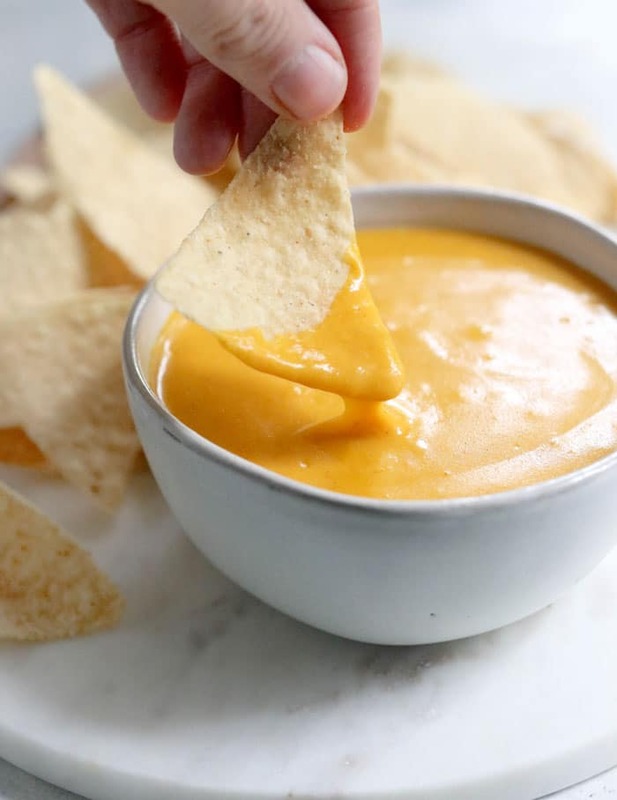 This easy vegan cheese sauce reminds me of the nacho cheese sauce they serve at baseball games and movie theaters. I love that it's naturally nut-free and soy-free! To cook the carrots and potatoes, fit a steamer basket into a small sauce pot and fill it with an inch of water. Place the chopped carrots and potatoes into the steamer basket and bring the water to a boil. Once boiling, lower the heat to a simmer, cover the pot and let the vegetables steam until very tender, about 10 minutes. While the vegetables are steaming, add the water, nutritional yeast, starch, lemon juice, salt, paprika, onion powder, garlic powder, smoked paprika (if using; I left this out) and a pinch of cayenne pepper, if desired, to your blender pitcher. When the steamed vegetables are tender, lift them out of the pot and add them to the blender. Blend until the mixture is very smooth-- it will be runny. Drain the sauce pot of the water from the steaming process, then pour the blended mixture into the empty pot. Heat the sauce over medium heat, stirring with a whisk until it thickens, about 3 to 5 minutes. Slowly whisk in the non-dairy milk until you reach your desired consistency. Make it Ahead: You can blend the sauce ingredients (omitting the non-dairy milk) and store them in an airtight container in the fridge for up to 5 days in advance. When you're ready to serve it, pour the mixture into the sauce pan, bring it to a boil and stir until thickened. Add the milk as needed for consistency and adjust the seasoning to taste before serving. This recipe is adapted from Alisa’s original recipe in Go Dairy Free, which doesn’t call for a potato. To make her recipe as written, omit the potato, use 6 tablespoons of a mild-flavored oil, like grape seed, and increase the starch to 4 tablespoons total. You may also want to use a little more water to thin the sauce out as needed. The starch makes it very stretchy! 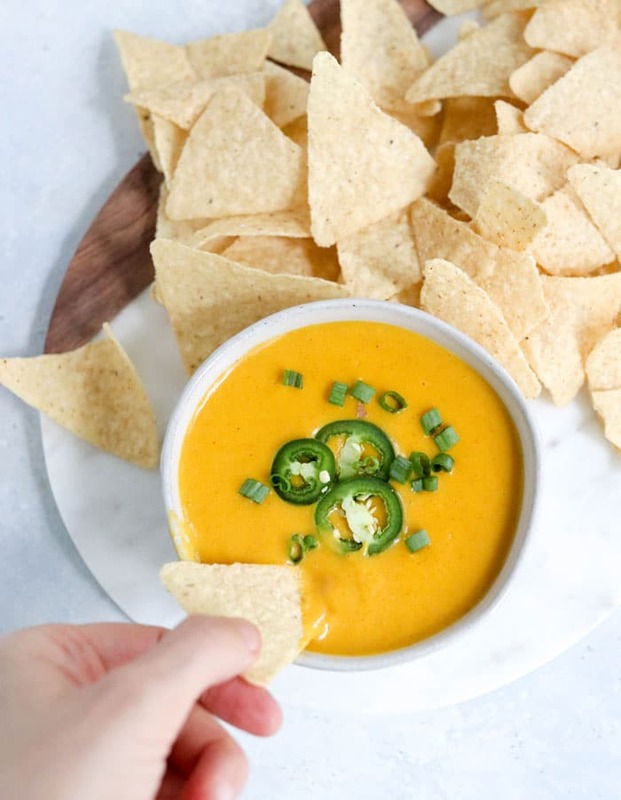 There are two other vegan cheese sauce recipes on my site if you’re looking for a substitution, so check them out! 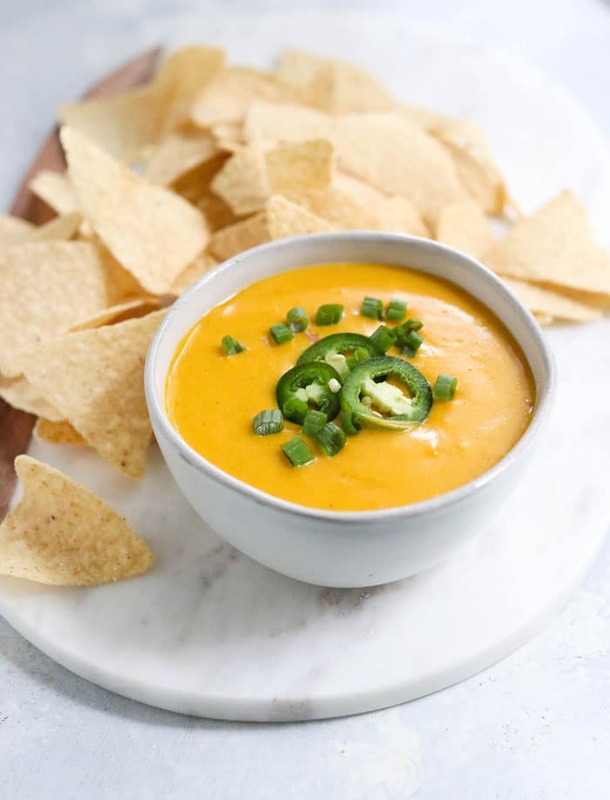 Here are my cashew-based queso and my sweet potato queso recipes. Thanks to Alisa for sending me her book and letting me share this recipe with you! I hope you’ll enjoy it soon. Reader Feedback: What other dairy-free recipes do you wish you had? Let me know if you have recipe requests! I am on a low/no-fat diet due to gallbladder issues and I made this without the oil or nut milk and it was awesome. Very creamy and delicious! Could you sub butternut squash for the potato? Where does the olive oil come in to play? Sorry, it gets tossed into the blender with everything else! I didn’t love the flavor-it tasted predominantly like nutritional yeast, which I don’t mind but doesn’t justify the extra dishes in my opinion 🙂 But the texture and color were spot on! And thanks for a nut free recipe. I cooked the veggies in large chunks in the Instant Pot on the steam setting for 10 minutes with quick release. Yay!! My youngest cannot have nuts, my older daughter and I cannot do dairy. Can corn starch be used in place of the tapioca starch? Love everything about you and your recipes! I would think so! Come back and let me know how it goes for you.